Listed below are some of the rivals of the Sony FE 70-200mm f/4 G OSS. The Olympus M.ZUIKO Digital ED 40-150mm f/4-5.6 is a compact and lightweight telephoto zoom lens for the Micro Four Thirds compact system camera range. Providing a 35mm equivalent focal range of 80-300mm and costing around £250 / $300, read our in-depth Olympus M.ZUIKO Digital ED 40-150mm f/4-5.6 review to find out if it makes the grade. 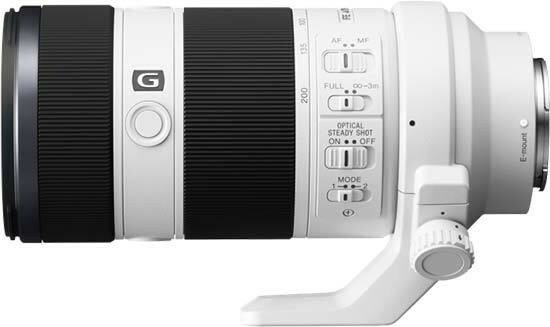 The Panasonic LUMIX G X VARIO 35-100mm F2.8 is a new premium telephoto zoom lens for the Micro Four Thirds system of interchangeable lens cameras. Offering an effective focal range of 70-200mm in 35mm terms, the Panasonic 35-100mm lens boasts a fast constant aperture of f/2.8, fast and quiet auto-focusing, quality construction and weather sealing. Read the World's first Panasonic LUMIX G X VARIO 35-100mm F2.8 review, complete with full-size sample images, to find out if it deserves a place in every Micro Four Thirds photographer's camera-bag. The Tamron SP 70-200mm F/2.8 Di VC USD is a fast telephoto zoom lens for Nikon, Sony and Canon full-frame DSLR shooters. Offering built-in image stabilisation, the compact Tamron 70-200mm lens has a constant aperture of f/2.8 throughout the range. Read our Tamron SP 70-200mm F/2.8 Di VC USD review to find out if it's the best fast telephoto zoom for full frame users.